Letterheads are the staple of your corporate image, much more than just a simple sheet of headed paper, they help to increase your brand awareness and convey a sense of professionalism in formal correspondence. 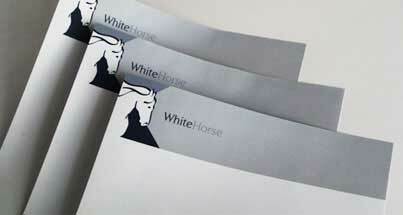 free assistance with your letterhead design at no extra cost. Upload your letterhead design then pick your print & material options. 100gsm Premium Bonded paper (laser & inkjet compatible). Our designers are on hand to create your letterhead artwork for you. Not all customer communication is electronic, and nor should it be. 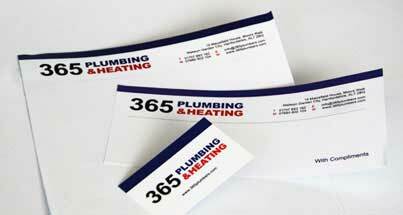 Company letterheads can be used in a variety of contexts, not just for the really formal stuff! Fundamentally, they create a professional image for your business, in turn making the receiver feel important and respected. Response rates to written communications are significantly higher than email or other electronic media. So for customer feedback and surveys, and other questions that need a response, sending a letter printed on a quality letterhead is much more likely to be read and replied to. Modern letterhead design should be engaging and employ innovation in layout and typography. Naturally this should be in accordance with your business brand, for example longstanding heritage businesses typically use traditional styles with a watermark. Many companies print their letterheads in-house, on desktop printers. They do this for a number of reasons which are in all honesty, modern myths! Print consumables cost money, especially colour toner cartridges, so the costs of printing your letterhead on your office printer are often hidden within your office stationery budget. In addition to this, the colour variance of most desktop printers will result in your letterheads being printed with incorrect colours and impacting your brand consistency. This is especially important if your business uses PANTONE colours within its corporate artwork specification. These are all compelling reasons to get your company letterhead printed professionally.